L 12 1/2″ (32 cm). Song is short, creaky “koguba-leek,” sounds like an unoiled wheelbarrow. Description: Long, keel-shaped tail; pale yellow eyes. 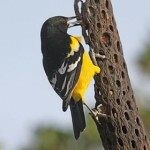 Male is black overall, with a purplish sheen on head, neck, and breast. Some males may have a bronze sheen on rest of body and green sheen on head. Females are smaller and duller than males. Juveniles are dusky brown with brown eyes. Food: Common Grackles are omnivorous, and will eat insects, grains, and occasionally both the eggs and young of small birds. 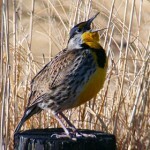 Habitat: Breeding birds are found in woodland edges, residential areas, parks, farmsteads, and shelterbelts. Where in Nebraska: Migrants are often seen in large flocks in residential and rural areas. 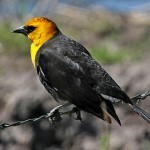 Common to abundant spring and fall migrant and summer resident across the state. Occasionally overwinters, especially in southern counties. 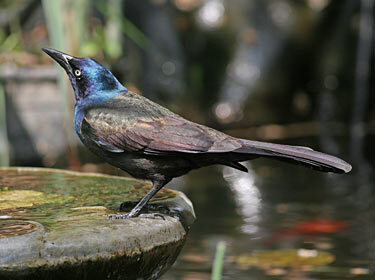 Fun Facts: Common Grackles walk instead of hop; the young have dark eyes, not yellow like adults.